Acadia National Park is located on the coast of Maine on Mount Desert Island. Over 3 million people visit Acadia National Park each year. The Park has over 47,000 acres and features an array of landscape from rocky cliffs, lakes and ponds, ocean shoreline to evergreen forests. Such diversity supports the large amount of wildlife and plants that can be found in the Park. Acadia National Park was created due to the visions of private citizens in the area who made land donations and who worked for its preservation. The scenery is breathtaking. 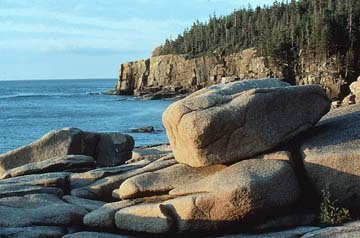 Rocky coastline of Acadia Nat’l Park as shown on the NPS website. A 27 mile scenic roadway begins at the Hulls Cove Visitor Center and offers access to such sites as Sand Beach, Thunder Hole, Otter Cliffs, Jordan Pond and Cadillac Mountain. From October 7 to March 6, Cadillac Mountain is the first place in the United States where you can see the sun rise. Acadia has 120 miles of hiking trails with various degrees of difficulty. Terrain varies from rugged shoreline and deep woods, to open mountain summits with views of the ocean and outer islands. A hike up Cadillac Mountain should be at the top of your list in order to see the awesome panoramic view. Acadia’s is also known for its 45 miles of carriage roads that wind throughout the mountains and valleys of the park. These carriage roads were a gift from philanthropist John D. Rockefeller, Jr., and his family. They are great for walking, hiking, biking, horseback riding and carriage rides. Ranger Programs are also fun and are very educational. There are two campgrounds in the park. All park campsites are situated in woods, and are within a 10 minute walk of the ocean. Make sure you arrive early during peak times, if you want to get a campsite. Acadia National Park is a definite must if you enjoy the outdoors. You will be amazed at its extraordinary scenery and abundance of wildlife. Visit the Acadia National Park website for more information. Enjoy your camping and hiking adventures!